Imagine playing with your Scottish fold kitten. He or she pounces you and you fight back with your hands or feet. Fighting and playing is a very entertaining experience for both, the kitten and you. If only you’d knew that this is wrong. Why? We will return on this in a minute. 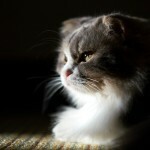 Scottish folds more than any other breed need activity, fitness and good health. This is because Scottish folds are prone to cartilage disorders. These disorders tend to get worse and appear more often if your cat is overweight or lacks good health. It is important that your fold has received all the necessary vaccines. Your breeder and vet can guide you through what your fold needs. You can also have a look at this article which explains vaccination in greater detail. Proper Nutrition is even more important than vaccination. Malnourished cats, including folds are more prone to diseases and allergies. Make sure you feed your fold proper cat food with small amount of grains inside. Allergies usually manifest themselves on the skin and can be caused by environmental triggers or food. If you suspect your cat has an allergy don’t let it get worse. Address the symptoms, search for the triggers and remove them from your fold’s environment or plate. Outdoor cats are not in danger of low activity, but they do face other dangers that can diminish their health. If your cat hangs out in the wild, make sure it is altered, has an identification collar and is microchiped. Also your cat will need medications for fleas, ticks and other parasites. Worming your cat often is also advised. You should also visit more frequently your vet for health checks, maybe twice as often compared to an indoor cat. You can’t avoid your cat eating bad stuff and drinking from dirty waters (you may try a cat water fountain). You can’t prevent your cat fighting with other cats either (even though altering minimizes aggressive behaviour). What you can do is keep your cat safe at night, this is the time most cat fight occur. You can also make sure your cat is full in terms of food and water (Non-dry Diet). Having your Scottish fold indoors will save it from all the dangers of the outdoor city life. But it can easily lead to inactivity, boredom and in the end bad physique. In order to keep your fold fit, you have to play with it daily and also provide him/her with toys to stimulate activity and fun. Laser beams, cat toys or even another cat can all be great for your fold to keep it entertained and active. Note: Introducing cats with each other can be a troubling task, if you chose this solution it is better that they start together as kittens. Since most Scottish folds are bred with British Shorthairs they have ancestors from this breed. For this reason they usually like being active. If your fold is too lazy this might be a sign of OCD or some other medical problem. You should report this to your vet. If you are still wandering about that wrong kitten play here it goes. Cats, folds included learn about life as kittens. Whatever you teach them as kittens will do as adults. This learning can’t be undone easily, adult cats will always have the urge to do what they’ve learned as kittens. You keep your Kitten active from an early age. You make sure the activity and games you play don’t make you a target. If you don’t play with it you might end up with a lazy cat or even worse with a fat kitten. Fat kittens usually become fat adults, which is definitely something you want to avoid in the Scottish Fold breed as we’ve said earlier. Also remember that cats and kittens play to express their predatory instincts. As you can understand this can cause a lot of trouble later in their adult life. As a kitten it might be fun to charge you or fighting/playing with you but as it grows up it won’t. Teach your kitten to fight you and it will be fighting you/and other humans for life. Instead you should be playing other games like fetch or anything that does not make you or any other human “the target”. If you liked this article, please share and like!